Four out of the top six US Cable Companies call CAS Group for answers. 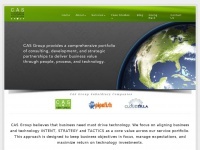 The web server used by Casgroup.biz is located near the city of Ashburn, USA and is run by Joyent. The website Casgroup.biz has a own web server. The web server only runs this website.